This interview is part of our 2015 fund drive bonus issue! Read more about Strange Horizons's funding model, or donate, here. 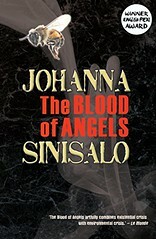 Johanna Sinisalo is the author of six novels and numerous short stories. 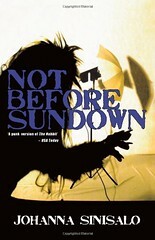 Her first novel, Not Before Sundown / Troll: A Love Story (2000, translated into English 2003) won Finland's highest literary award, the Finlandia Prize. Set in a world in which trolls are rare but real animals, rather than mythological creatures, the novel explores the gendered territoriality of human relationships; it won the James Tiptree Jr. Award on its U.S. publication. Also translated into English are her novels Birdbrain (2008/2010) and The Blood of Angels (2011/2014) (reviewed here by Nina Allan), and a number of short stories, including Nebula nominee "Baby Doll" (2002/2007). Forthcoming is alternate-present dystopia The Core of the Sun (2013/2016). 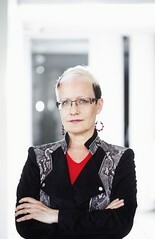 In June 2015, Sinisalo received a prestigious five-year grant from the Arts Promotion Centre Finland, and in August she was announced as one of the Guests of Honour at Worldcon 75, which will be the first Worldcon to be held in Finland. This interview was conducted in person at Archipelacon in June 2015. Niall Harrison (NH): So I guess where I would like to start is to ask: do you feel that the three of your novels that have been translated into English— Not Before Sundown , Birdbrain , and The Blood of Angels —are a representative sampling of your career? What don't we in the Anglophone world know about your career? 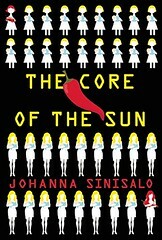 Johanna Sinisalo (JS): Well, for one thing I have written quite a lot of short stories. We have a Finnish national prize for the best short story of the year, and I have won it seven times, so I presume that means people have good opinions of them! I do think many of them would be worth translating. But short story collections are very difficult to sell. And then I have a couple of novels that have not been very widely translated. I think that Lasisilmä ( The Glass Eye ), for example, has only been translated into German. NH: What's that one about? JS: It's my third novel, quite a different book from my other works. I worked for television for a couple of years, and I spent a year as a story editor for a daily soap opera. That's a world of its own, it definitely is. I think it's fascinating to live in that kind of a situation where you are literally playing god. You are making fictional people dance, and then there are a million Finns who lived that artificial life with those characters. So I thought that it would be nice to play with the idea, for example, what if a story editor would start to manipulate her own surroundings like it was a kind of drama? Is she causing things to happen when she writes? I just played with that idea. It's not actually very fantastical or science fictional, perhaps it is more like a psychological thriller. And of course there's my second novel, Sankarit ( The Heroes ), and it has never been translated into any other languages for a very obvious reason, which is that it's based on the Kalevala , and to really get the book you have to know your Kalevala in and out. The more you know about the Kalevala the more interesting the story gets. It's a very close rewrite but placed in the 1990s, so the sages and warriors are ice hockey players and rock stars and computer wizards. NH: That's interesting because a couple of the novels that have been translated are also very strongly in dialogue with specific texts— Birdbrain for instance is in dialogue with Conrad's Heart of Darkness . Is that something you do a lot in your writing? JS: Yes, very often I have some kind of ur-text, and I explore variations in my book. Conrad's Heart of Darkness was a story about stepping into a savage world in which the rules of Western society do not count any more; I found that concept very interesting. I like to play with intertextuality on very many levels, that's one of my trademarks—as you know I very often use excerpts from fictional non-fiction documents as well. NH: That's one of the aspects of your writing that I find fascinating. You have in all of your translated novels sets of competing voices, and usually found documents bringing in more information, from news stories in Not Before Sundown , to the eco-activism blog in The Blood of Angels , which is a fictional version of actual real factual information. So you have a tension between the non-fiction and the real, and the fantastic and the invented. What is the goal of creating that tension? What do you like about bringing in all the different voices? JS: I think one of the reasons is that I see reality as very subjective experience. If we have a series of events and we are following two or more people, each from their own point of view, you can have a deeper experience of the whole situation, because it's not only one person's experience. I am fascinated by how a human being meets something strange or just plain new, or a bit distant. Perhaps like a nuclear power plant—very few people have visited a nuclear plant or know how it looks or how it works, but they have bits and pieces of information. They remember Chernobyl, and if they are Finns they remember that our newest nuclear plant has tripled its budget, and maybe they remember Homer Simpson works in a nuclear plant. And from these bits and pieces one person starts to form her or his own subjective reality, a subjective nuclear plant. So in my books, for example, I don't want to push the reader to believe that trolls exist, I want to make the reader work with me, let them put it together, because that is imitating the actual process of getting information and grasping concepts. The reader commits to the idea, because they are doing part of the work. And I'm very keen on building in details, I'm always after more knowledge, if I write about a person who is an undertaker and a beekeeper, I do field trips! NH: That character in particular, in The Blood of Angels —I thought he added to a very effective mix of personalities. Of masculinities, really. You talk about everyone having their subjective truth. Obviously the book of yours that was first recognised in English was Not Before Sundown ; in the speculative fiction world it won the Tiptree Award for "expanding or exploring our understanding of gender roles," and in that book gender roles are a particular aspect of everyone's subjective truth. That seems to be something that carries through your other novels where you have these characters who, it seems to me, very strongly inhabit a particular gender role and then perhaps end up in conflicts because of that. Is that something you're consciously exploring? JS: Yes, I think that sexuality and gender are a significant force in us. All of these books are in part about how we have to cooperate or work to change the hierarchies between us, and not just in this way—they all also have a very strong element of nature being part of us. I think I often have in my characters a kind of dark side that is often in very close connection with natural worlds in some way. NH: The role of the non-human in your work is something else I wanted to talk about. I guess there are two aspects—the role of animals or creatures, and the role of landscape. Let me ask about animals and creatures first. Do you see yourself as bringing non-human entities into contact with the human, or do you see yourself as expanding the definition of humanity to include the non-human? JS: Exactly the latter. People like to think there is a very sharp line between animal and human being, and I disagree. I think there are lots of little steps between the two, and between each other, and we really shouldn't think that we are somehow separate from nature. We should recognise that we are animals, that we are hierarchical pack animals and that dominates our behaviour every day, in the ways that we are competitive and so on, but we don't want to think about it. Our originality and uniqueness is an illusion. I want to have a prominent role for nature and the environment and other creatures, so that we understand that we can't survive on this planet by ourselves. NH: So if you're bringing animals into the human, and looking at the animal in the human, can you talk about how that affects how you explore gender roles? JS: In the same way you can't put a strong border between the human and animal, you can't put a strong border between genders. For example in my latest book to be translated into English, The Core of the Sun , in fact there are four sexes, two male and two female. The male sexes are mascos (masculine men) and minus men, who are physically weak or in other ways not masculine enough. The female sexes are named in a Wellsian way: they are eloi and morlocks. Eloi are bred to be super feminine, submissive, and stupid. Their main goal is to get married and have children. Intelligent and not-so-good-looking females are morlocks and they are used in menial tasks and sterilised before they are in a reproductive age. NH: So gender is a way of dividing up the human experience—and in fact this ties in with your point about subjective truths, doesn't it? We typically divide human experience into two, but there are other genders than male and female, and in this novel you have four as the default, but there could be other ways of doing it as well. NH: Moving on, can you talk a little about how you see the role of landscape in your work? In your discussion about "Nordic Weird" with Karin Tidbeck earlier in the convention, you mentioned the importance of forests to Finnish psychology, which comes across very clearly in, say, Not Before Sundown . The other thing that's been very striking to me, on my first visit to Finland, is the coast, the sea, the islands, the lakes. Do they also feature in your work? Or is it the forest landscape that gives you the most inspiration? JS: Yes, perhaps. One obvious reason is that I was born in the middle of a forest, in Lapland, in very sparsely inhabited country. And when we moved to Tampere in Southern Finland, my father worked in the air force, and we lived in a closed compound, you couldn't enter if you weren't working there, it had high spiked fences. But inside the fences everything was like it was ages ago, totally natural forest. It was our playground, so it's close to my heart because of that. Of course I also know how special the relationship with forests is for Scandinavians is in general, this is what I talked about with Karin, that it's not a threat but a sanctuary, a place to escape to. NH: To what level are you involved in the translation of your work? Your voice comes across quite strongly and consistently through the three translated novels. JS: And they have been translated by three different people—Herbert Lomas ( Not Before Sundown ), David Hackston ( Birdbrain ), and Lola Rogers ( The Blood of Angels and The Core of the Sun ). I couldn't translate myself, but I always read very carefully and discuss the nuances of the text with my translator. NH: Have you found any major differences in reception of the novels between English-language readers and Finnish or Swedish readers? JS: There is not enough feedback to make a comparison. And I can read English reviews if I want, but if for example there is a Latvian translation I have no way of knowing what they make of it in Latvia, because the publishers are usually small companies who don't have the time or resources to collect reviews and translate them into a language I can read. So mostly I know nothing about the reception. But from what I do know I don't think there is much of a difference, it's my understanding that in both Finnish and Anglo-Saxon readerships there are people who love those books and people who hate those books! NH: You mentioned earlier in the convention that you initially thought Not Before Sundown might never be translated. What was it about the book that made you feel that way? My own experience of it was very powerful. I took it on holiday with a group of friends not long after the English translation was published, and nearly ten people read it in a week, it was a huge hit! And most of us in that group, I think, had not read a Finnish writer before, but we all felt that the characters were fascinating and the situation was clever and the structure was compelling. So I was surprised, I guess, that you seemed to be implying that this novel, perhaps more than your others, would not translate well. JS: It was my first book, so perhaps I was a little too serious about it, and of course the Kalevala book is even worse, but—there are things like, there is an excerpt from Tuntematon Sotilas by Väinö Linna (available in English as Unknown Soldier ), which is a book everyone knows by heart, but I tampered with the text a little bit. So a Finnish reader knows exactly where the trolls were in that universe I was creating, it was very, very specific. And there were some specific references to individuals who were well-known in Finland, they were mentioned by name in the original text. 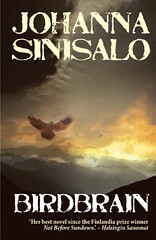 Those kinds of things don't translate, and in some ways they are not so important, but, for example, I thought that the only way that book could be perfectly translated would be to replace every excerpt from a real Finnish book with a similarly tampered excerpt from a real book in the new language. So that people would have the "Oh my god, this is something I know, but there were no trolls!" reaction. NH: Finally, I wondered: would you describe, or accept a description of, your novels as "political"? To me it seems both that within the novels you have characters with clear and strong points of view, and that behind the novels there is a strong point of view as well. Which to me makes them political and that is welcome, whether it's to do with gender or the environment or something else. But very much in the way that writers are often—for good reasons—wary of being described as writing science fiction or fantasy, a lot of writers seem to not like the term "political," because they think it has connotations of being very didactic, hectoring. Is that something you think about when you are writing fiction—that you have a point of view that you want to make the reader think about, want to challenge them with? JS: I myself would gladly define my novels as political. It might be a cultural thing, but if in Finland you said, "this is a political novel," that's something that would have an undertone of intelligent and analytical, serious work, with as you say a point of view. And because science fiction and fantasy have the reputation of being entertaining and a little bit fairytales for adults, "political"—that suits fine! NH: Those are certainly terms I would happily apply to your works. Thank you very much for talking to me, and congratulations again on your recent grant—I look forward to reading the novels that result!